As i usually do on a tuesday on my lunch break, I went into my Sales managers office and asked to take a car out on lunch. Just as I got out there, it started to rain quite hard, and continued for much of the hour. After 15 minutes, I gave up for that day and tried again the next day. Initially, I wanted to review a base 2017 Elantra, as I had just watched a Jalopnik video on what the best sub-$20,000 cars are. That car, sadly, was out on a test drive already. So, I just asked for a set of keys to anything, and this is what I ended up with. 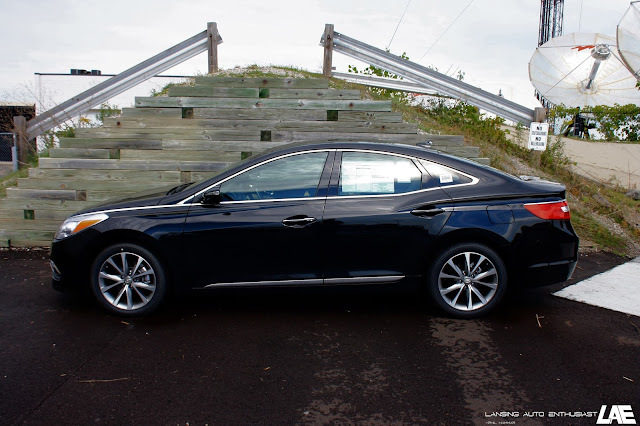 This is the 2016 Hyundai Azera sedan. 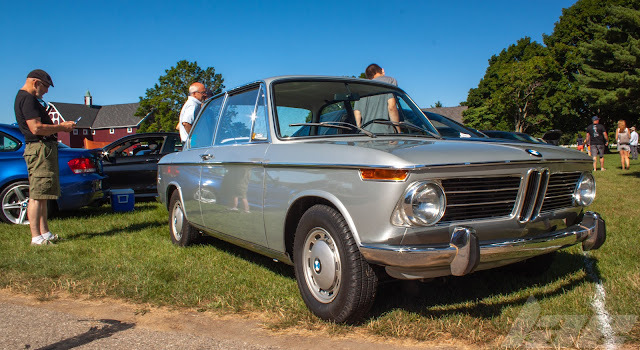 This is the second generation Version, and perhaps the final year of this bodystyle, and potentially this model all together. 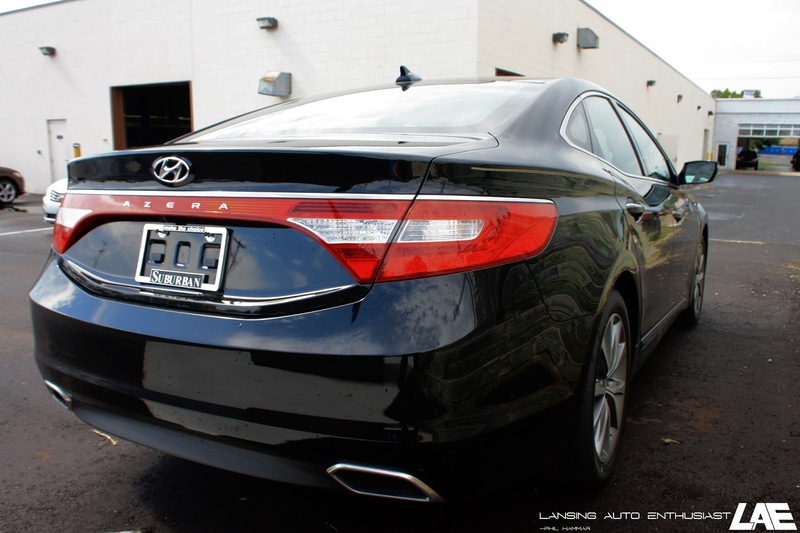 At first glance, you may notice a striking similarity to the 2011 - 2014 Sonata (YF generation). From what I'm told, this car is built on the Sonata chassis, but is wider and longer than the Sonata. In all trim levels, you get the 293hp 3.3L DOHC V-6 with Direct Injection. Power is delivered to the wheels via a 6-speed automatic with Shiftronic manual shift mode. 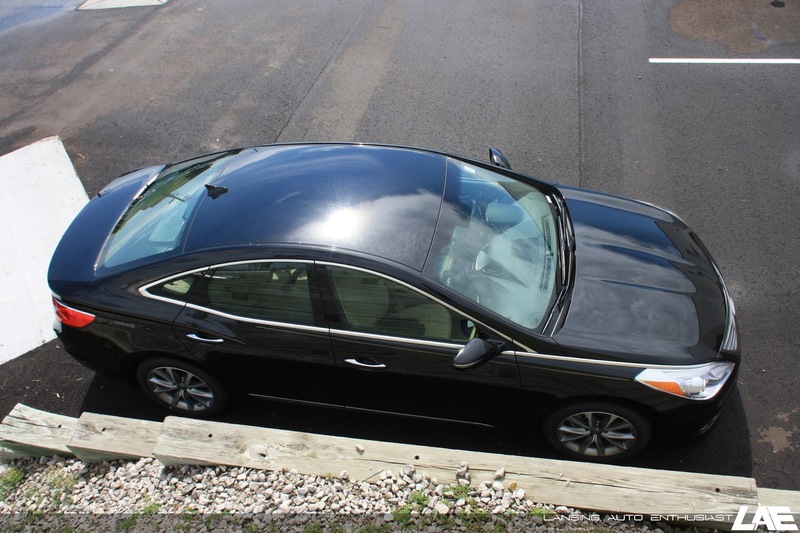 Priced at $35,000, this car fits right into the same segment as the Toyota Avalon, the Lexus IS, the Nissan Maxima and the Chevrolet Impala, among other cars. While this model is only available in Front-wheel drive, it handles very well, thanks to it's McPherson strut setup up front, and a multi-link setup in the rear. The steering feels direct and responsive, thanks to a speed-sensative Variable-effort Electronic-assist power steering gear. 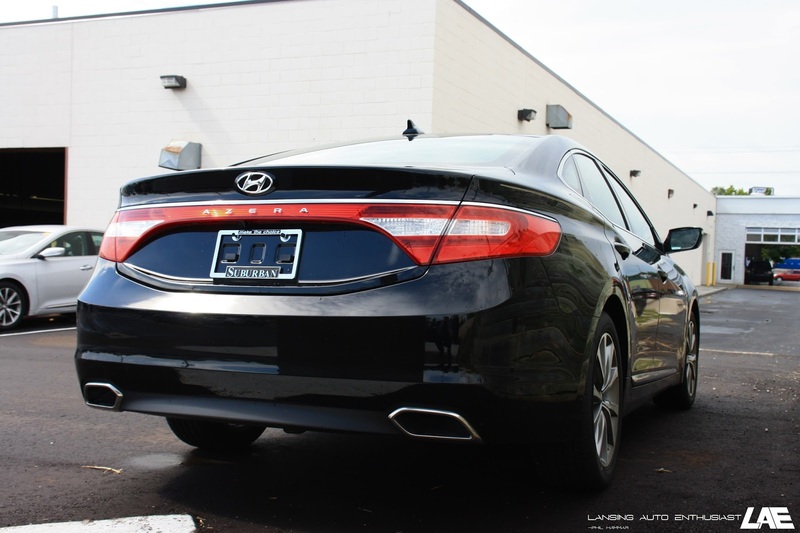 The dual exhaust tips and LED tail lamps make for an agressive look. 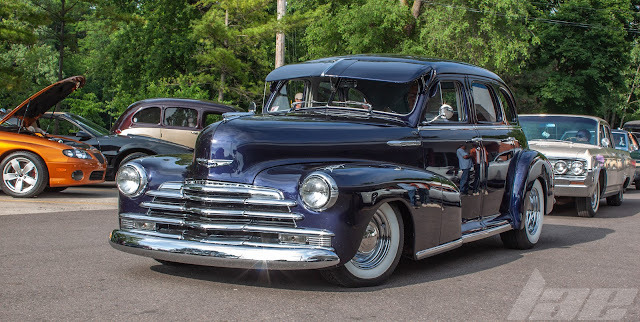 The overall styling on this car is pleasing to look at. Especially the rear quarter panels. The lines of the rear haunches, which start midway back on the rear doors, and wrap around to the decklid, add a nice touch. This particular car has had some custom pin striping done in-house. The interior and amenities on the car really make this car a nice place to sit, drive and ride. 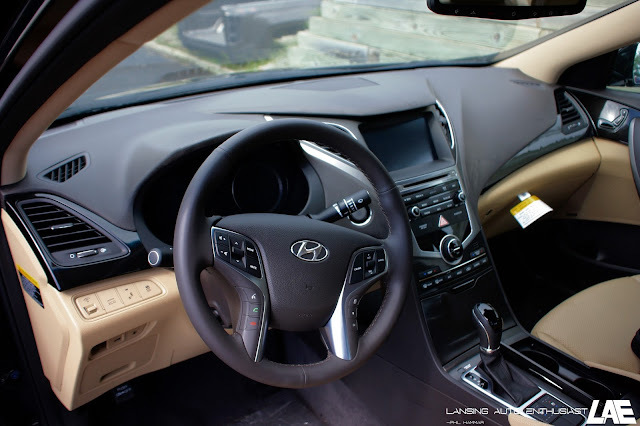 The 8" touchscreen display controls the Navigation, SiriusXM satellite radio, HD radio, AM/FM radio, CD player, bluetooth streaming, hands-free phone and vehicle settings. Some of which can be accessed via the steering wheel controls. If my count is correct, there are at least 8 airbags in this car, including drivers knee airbags and a ceiling airbag. 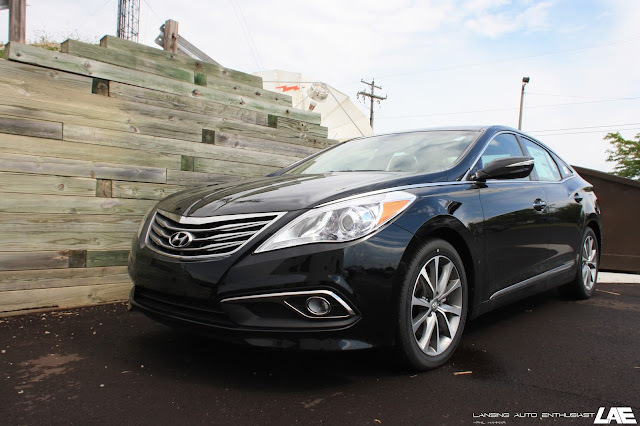 In addition, the Azera is also equipped with electronic Stability Control, Traction Control, Alti-Lock Brakes, Blind-Spot Monitoring, Tire Pressure Monitors, and a rear-view camera. Limited models get a moonroof and radar-guided cruise control. If you are interested check this car out here. Check out other offers and inventory at Suburban Hyundai of Lansing. Thanks for reading, keep checking back for more content soon.